Human Rights Watch’s Jose Miguel Vivanco and his colleagues produced a report calling the agreement on victims’/justice “pacting impunity” and a “piñata of impunity” primarily because the big majority of serious war crimes would not be tried and because the cases selected as “representative” that would be processed would not result in real jail time for perpetrators of grave or other war crimes (whether committed by government troops, guerrillas, paramilitaries, or others), but in “alternative sentences” of community service with what Human Rights Watch worries are dubious, unclear “restrictions” on residence and liberties. President Santos and his administration’s High Commissioner for Peace/peace negotiator Sergio Jaramillo disputed Human Rights Watch’s report, insisting that the agreed “transitional justice” does not grant impunity and is a world trail-blazing, “historical,” creative, skillful milestone that would confront grave war crimes and draws a practical balance between peace and justice. Moreover, Pres. Santos and High Commissioner Jaramillo stress that peace would prevent future victims and save lives and that the “transitional justice” is within the parameters of international treaties signed by Colombia, such as with the International Criminal Court (ICC). Human Rights Watch doesn’t buy Pres. Santos’ and Sergio Jaramillo’s argument. Of course, it is the job of human rights activists to strive for as exemplary justice as possible in an imperfect world. But there appears to be concerns, unease, uncomfortableness or questions about the victims’/justice agreement among some Western officials (in private or publicly) or in some US Congressional circles, such as on Colombian guarantees to protect FARC leaders/members from extradition and an apparent categorization of drug involvement to fund the FARC’s war chest as a politically connected crime to receive amnesty. (What kind of precedent would that set? some worry, even understanding the FARC’s and Pres. Santos’ argument that no one would sign a peace accord to be extradited to a foreign jail.) For the record, the US State Department has reaffirmed that US extradition orders against FARC leaders/members–and against others–remain intact and active, whatever Colombia decides to do as a sovereign nation on the question of US extradition requests. While the victims’/justice agreement has a clause supposedly protecting the agreement from international judicial entities or those of individual nations, Human Rights Watch and Inspector General Ordonez say that such so-called Colombian protective jurisdiction measures aren’t valid, in their view, and point to Colombia’s existing treaties. Will the ICC intervene if the victims’/justice agreement eventually goes into effect as now written? James Stewart, Deputy Prosecutor of the International Criminal Court reportedly indicated in an Organization of American States forum February 10 that ICC support for the judicial aspects of a Colombian peace accord would be conditioned on what kind of penalties are meted out to those who have perpetrated war crimes or violated International Humanitarian Law. 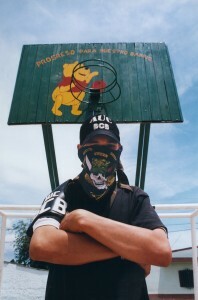 A Colombian “paramilitary” urban organizer in Barancabermeja in the early 2000s. Remnants of the demoblized United Self-Defense Forces of Colombia (AUC) have “recyled” into “post-paramilitary” outlawed organized criminal groups known as BARCRIMS, say Colombian authorities. © Photo by Steve Salisbury. All rights reserved. Said Stewart, cited by El Tiempo newspaper: The Office of the Prosecutor has to remain satisfied that the fight to end impunity on the most serious crimes is being waged in a legitimate way. With respect to Colombia, he said, the question will be if the imposed sentences in the context of transitional justice have served this purpose in what is referred to as most grave crimes. Some factors to keep in mind are: A) to intervene, the ICC would have to receive a convincing case that the case country (Colombia here) is unwilling or unable to judge by itself grave “systematic” war crimes through a serious, acceptable, capable, judicial frame-work (the word “systematic” appears to give leeway on interpretation), and the Colombian government argues that it is willing and able through its “transitional justice; B) each country has its own idiosyncratic nature and individual circumstances to take into account; C) Pres. Santos’s administration had consulted with the ICC on this issue before the victims’/justice agreement was announced and has “lobbied” the ICC on why the Special Jurisdiction for Peace fulfills ICC parameters, and D) the ICC presumably may not want to be seen (though it says it is blind to political and public-opinion currents) as essentially undermining the Colombian peace process by action against the victims’/justice agreement. But who knows? International judicial entities can be difficult to predict. However, one thing seems to be predictable: Some lawsuits against the victims’/justice agreement in national or international venues, which could drag on for years. But what is the alternative to the victims’/justice agreement and an eventual overall peace accord? Pres. Santos asks. Decades more of killings and other violence and destruction, which would violate the human rights of future victims, tens of thousands of victims over how many more years? To better understand the victims’/justice agreement, it helps to keep in mind the background and that the FARC has insisted from the start of the peace negotiations on its “red-line” issues that no FARC members go to jail and that the FARC has political participation. However, as Pres. Santos’ adviser Jonathan Powell explained in a lunch meeting late October to me, Harvard conflict-resolution expert/Santos adviser William Ury (author of the best-selling book Getting to Yes) and three Colombian retired generals concerned about military judicial rights being or potentially being trampled: In today’s world, there can be no blanket amnesties for everyone. The victims and public at large won’t stand for it. They demand some sort of judicial recourse, framework or accountability, even if restorative, reparative and not retributive in some circumstances. And if there were blanket amnesties for grave war crimes, they could be nullified by future governments of the country in question (in this case in Colombia) or have attempts at intervention by international courts. So, the thorny crux of the matter is: How to provide that judicial framework, within the parameters of Colombia’s Constitution and the International Criminal Court? How to have those accused of grave war crimes face courts where judgments are rendered? And how to get the FARC to accept it when the FARC insists that it won’t sign an overall peace accord where any of its leaders/members would go to jail? The answer, as seen in the agreement on victims’/justice: a Special Jurisdiction for Peace, where tribunals could mete out “alternative sentences” for prompt confession (collectively and/or individually) of grave war crimes by the FARC, state agents (including in the military and police), other actors in the war (such as former paramilitaries) and “third parties” (such as civilians) with some concrete connection to the perpetration of serious war crimes. The sentencing structure would be: 1) A two-to-five-year alternative sentence of essentially community service to those connected though not determinant to a grave “representative” war crime and who confess it promptly and tell the truth as fully as they know. If confessed belatedly, the sentence could be two-to-five years of ordinary jail. 2) Five-to-eight years of an alternative sentence of essentially community service for those who played a determinant role in the perpetration of a grave “representative” war crime, though who confess it promptly and disclose full truth from what they know. If confessed belatedly, the sentence could be five-to-eight years of ordinary jail. 3) Fifteen-to-20 years of ordinary jail time to those who deny perpetrating a grave war crime, but are found guilty of it. 4) Amnesty would be granted to FARC members whose crimes were of “political” connotation (such as rebellion) and who didn’t commit serious war crimes. 5) Those who confess crimes of an extraditable nature shown to be motivated/related to the armed conflict will not be extradited. What would be an alternative sentence? The agreement states reparative/restorative acts, such as reconstruction, de-mining, eradicating illicit drug crops, cleaning up waste and residual matter, environmental improvement, making direct reparations to victims, helping society at large, promoting peaceful co-existence, learning and education, etc. Some wonder if that could include FARC leaders carrying out their duties as members of Congress, getting paid a Congressional salary. Or if learning English or about Colombian major cities by the FARC’s vastly rural membership would qualify? An aspect not clear in the agreement, which could potentially be a can of worms, is what is specifically and really meant by “restrictions of liberties” of those carrying out alternative sentences. The agreement spells out clearly that there will be no prison or any equivalent to prison for alternative sentencing and says that effective restriction of liberties could/would include restriction of residence and movement, with monitoring and supervision, while the court-approved designation of community-service projects of alternative sentencing are being carried out. Colombian High Commissioner for Peace Sergio Jaramillo wrote in a letter to Human Rights Watch that the Tribunal for Peace would decide on the activities, work reparation, place of work reparation and conditions of restrictions. According to Jaramillo, with “respect to the most grave and representative crimes, the duration of the sanction in any case shall be from 5 to 8 years, independently of culmination of the works of reparation.” President Santos insists that “restriction of liberties” means a restriction of movement to a specific localized area and not to areas of the scope of an entire province or region. Interpretation is at the heart of concerns: Could this mean that judges allow confessed perpetrators to go freely in and out of their homes and to about wherever they want, as long as it is justified as “community-service”-connected and supervised/monitored? Or on the flip side, would this mean that confessed perpetrators have “house arrest” or “farm/ranch arrest” and are allowed strictly limited mobility only to carry out their community service duties? The former would apparently produce an uproar among human-rights groups, and the latter could produce an uproar from the FARC, which could argue that such an interpretation for alternative sentences is not what it understood when it signed the agreement and that this interpretation would undermine the letter and spirit of the victims’/justice agreement where it is stated that the Tribunal for Peace is to render sentences keeping in mind the promotion of peace. Another unclear aspect still to be determined is: Who will be the esteemed, prominent, “third-party” figures who will select the 20 Colombian and four international judges, as the agreement stipulates, to comprise the pool of the Special Jurisdiction for Peace’s Tribunal for Peace? Pres. Santos has suggested that the Vatican, United Nations or another kind of multinational commission can play a role in this. The concern of Human Rights Watch and others is that the FARC and Colombian government’s victims’/justice agreement may allow the FARC and government to influence who the judges could be, and thus incur in a conflict of interest that may eventually lead to white-washes in the process. Pres. Santos and Sergio Jaramillo reject any notion that the judges will be in the pocket of anyone, insisting that the agreement includes high-experience, high-integrity requisites for the most qualified candidates. But this doesn’t reassure everyone in Colombia, where the president of the Constitutional Court is currently embroiled in a scandal and formally accused by Congress of alleged corruption to influence court decisions. Other questions: How will the Tribunal for Peace judges be eventually divided into subgroups and what will their exact procedures be to hear particular cases? How will the Investigative Unit director put together his or her staff to pursue cases? How will cases be deemed “representative” and selected to be processed? The victims’/justice agreement indicates that given the overwhelming numbers of war crimes during five decades of conflict, it wouldn’t be possible to try all of the war crimes, presumably taking into account limited resources, the passage of time and disappearance of evidence, and thus the “representative” and stand-out cases would have priority. But what happens to the vast numbers of cases unaddressed, especially with demands by victims or others to have them heard in a court and not just noted in a Truth Commission/No-Repetition report? And then there is the question of the judicial situation of the Colombian security forces. Separately, what happens judicially to the former rightist outlawed “paramilitaries”/vigilantes who demobilized about a decade ago under a controversial Justice and Peace law promulgated during the Uribe administration—which, criticized as “smoke and mirrors” by Human Rights Watch, has had mixed results at best, suffering a number of flaws. And what about civilians accused of connection to the perpetration of war-related crimes? 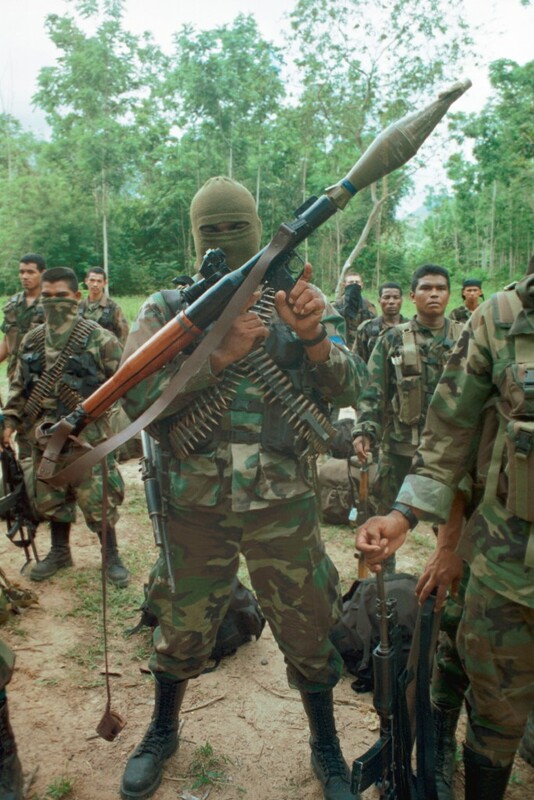 Now-defunct United Self-Defense Forces of Colombia (AUC) “paramiitaries” in Cordoba department in 2000. Some 2,200 former “paramilitaries” have been murdered since demobilizing, according to demoblized AUC “block”-unit commander Freddy “El Aleman” Rendon. © Photo by Steve Salisbury. All rights reserved. According to official statistics, cited in an El Tiempo article last October 18th, 35,353 “paramilitaries” demobilized and submitted to the Justice and Peace law as of about 10 years ago. Some 2,684 of those went to prison for grave war crimes with five-to-eight-year sentences (which human rights groups criticized as being too lenient), and only some 5.3% of those who have served their sentences were let free. The others remain in prison, even having served their terms, because swamped courts apparently haven’t been able to certify if the jailed “paramilitaries” have completely told the truth of the full extent of their criminal behavior to qualify for the five-to-eight-year sentences. Moreover, according to demobilized “paramilitary” leader Freddy “El Aleman” Rendon, who recently was released after serving his jail sentence, more than 2,200 demobilized “paramilitaries” have been murdered. Why should the FARC not go to jail, while 2,684 demobilized “paramilitaries” did? The FARC says that there is a difference between what the FARC sees as the FARC being a “legitimate rebellion” against a “corrupt, repressive, unjust” state and the “paramilitaries” as being murderous thugs doing the state’s dirty work (whether in complicity or not with government forces). The “paramilitaries” said that they came into existence in self-defense against ruthless guerrilla encroachment into a security void left by a weak state back then. The Colombian military and police have always insisted that any collaboration between their members and outlawed “paramilitary” groups was never institutional. The late AUC leader Carlos Castaño had told me that in the mid-1990s and earlier, “paramilitaries” had significant collaboration with some members of the military and police that went up the ladder of rank. He talked of a retired general whom he described affectionately as a “gordito simpatico” (loosely translated as “nice hefty”) and said that he wanted to erect a statue in honor to him as a “patriot.” But Castaño added to me, when I met with him in my journalistic capacity in the year 2000, that due to pressure from the United States, Europe and other countries, collaboration between “paramilitaries” and elements in Colombian security forces was reduced significantly to cases of mostly middle- and low-ranking security-force personnel acting on their own, though some higher-ranking officers stayed in touch, one way or another. “The generals and the coronels are worried of losing their posts, if they collaborate with us,” Castaño said at the time, adding that some high-ranking officers looked to get promoted by combating his forces. Just in 1999, Castaño said, the Army killed 42 of his men in fighting, while the FARC killed 142 of them. However, it doesn’t matter to the victims whether or not it was guerrillas, “paramilitaries” or government forces who committed crimes against them or their loved ones. Victims groups are divided on the victims’/justice agreement. While some look favorably upon it, others are appalled. Some are willing to forgive, though not forget, and accept the terms of it. Others demand long prison sentences for the perpetrators of war crimes. The Special Jurisdiction for Peace would cover the Colombian military, police, paramilitaries and other actors in the armed conflict—the same sentencing structure to apply to them. The victims’/justice agreement says that the judicial frame-work, procedure and details are still to be determined for members of the Colombian military and police, though respecting and consistent with the Special Jurisdiction for Peace. Former paramilitaries apparently could avail themselves to the Special Jurisdiction for Peace. Ditto for “third-party” civilians connected to the perpetrating of war crimes. Referring to the military’s judicial situation, Pres. Santos, quoted by El Tiempo, in the Colombian Caribbean port city of Santa Marta mid-February, envisioned: “For all members of our Armed Forces who haven’t committed grave crimes, or be it war crimes against humanity [though who have committed war-related crimes], the renouncing of the exercise of penal action [by the transitional judicial system] is applied to them, that in practice is the equivalent to an amnesty.” In other words, suspending or not imposing jail sentences for crimes that don’t come to the level of grave war crimes. The Special Jurisdiction for Peace evidently would in effect allow paramilitaries still in jail, as well as government security forces’ officers and enlisted personnel in jails for war crimes, to go free to serve alternative sentences if they confess before the Tribunal for Peace. What about post-paramilitary organized criminal groups known as “BACRIMs”? Some experts say that the agreement is unclear if BACRIMs may be included in the Special Jurisdiction for Peace, since there appears to be a blurry gray area, given that a number of them spawned from demobilized traditional “paramilitary” groups, like the United Self-Defense Forces of Colombia (AUC), and continued to engage in clashes with guerrillas, even though the government says that the BACRIMs’ primary driving purpose is criminal self-enrichment and not vigilante counterinsurgency at the level of the demobilized traditional “paramilitary” groups like the AUC. But, despite language in the victims’/justice agreement to allay worries of potential judicial witch-hunts and abuses, those worries continue. This is not a surprise in a country whose judicial system has come under an avalanche of criticism for dysfunctionality, inoperability, over-bureaucratization, politicization, and numerous miscarriages of justice—with victims of what are widely seen as court injustices ranging across the political, economic, social, ethnic, racial, gender, sexual-preference, and cultural spectrums of Colombia. Retired general Nestor Ramirez, president of the Colombian retired Active Reserve of Generals and Admirals, and others in the military (active-duty or retired), business people and large landowner/rancher communities worry that politically, financially or axe-grindingly motivated bogus accusations could be made against innocent people who are then forced either to confess to crimes that they didn’t commit with the incentive of settling the matter with relatively little hassle and not going to jail or to plead not guilty and have to incur heavy legal-defense expenses to the point of possible financial ruin in a judicial ordeal that could drag on years and where one could be eventually unjustly convicted by judges whose impartiality wouldn’t necessarily be guaranteed, given their selection by “third parties,” whose selection, in turn, could derive from a presumed consensus between the FARC and the Santos’ administration. The FARC, among others, wouldn’t cry to see former president/now Senator Uribe brought before the Special Jurisdiction for Peace. While the victims’/justice agreement keeps in special judicial protections guaranteed by the Colombian Constitution for former and current presidents, it allows for accusations against former or current presidents to be informed to the Colombian Congress, and the language doesn’t appear to rule out that the Special Jurisdiction for Peace could have former presidents before its courts for alleged crimes committed before or after their being president, as Colombian Attorney General Eduardo Montealegre has interpreted the agreement.